Fine Dining, a modern menu of dishes inspired by Australian and British history. Headed by former Fat Duck head chef Ashley Palmer-Watts. We walked through a dark corridor and at the end of it was a monitor elevated showing surreal preparation of cooking. It felt like Dinner wanted us to play with our senses already. Came to the dead-end not knowing where to go next. The door on your right slowly opened and there you see a large dining area of the restaurant. Greeted by three ladies at the counter, we were then shown our table. Wished J happy birthday upon arrival. After seeing the counter at your left is the kitchen glassed and is the brightest in the room. Clean and many chefs working hard to produce each delicate dish. I love it when restaurants open their kitchen for their guests to see. It’s super intriguing – showing there’s nothing to hide. As you would expect for any fine dining that service must be on point. The pace was just right – no waitress would rush you to order straight away. They let us absorb the atmosphere and the view of the Yarra river. Menu was crafted like a card with the drinks menu handed by the waiter a short while after. We started off with two mocktails that wasn’t on their menu: a floral red one that tasted like plum and a citrus one that was a palette cleanser between every course. It was surprisingly small for the citrus cocktail, both for $16 each. We ordered the set 5 course menu, but because we had some dietary requirements, we ended up tasting more variety of dishes than planned! Win! Bread was complimentary with extra virgin olive oil and lightly salted butter in the shape of a swiss roll. We were offered two rounds of bread. If you choose to have meat fruit, suggest you hold off from your second bread until you have the meat fruit! I was carbed-out early on. 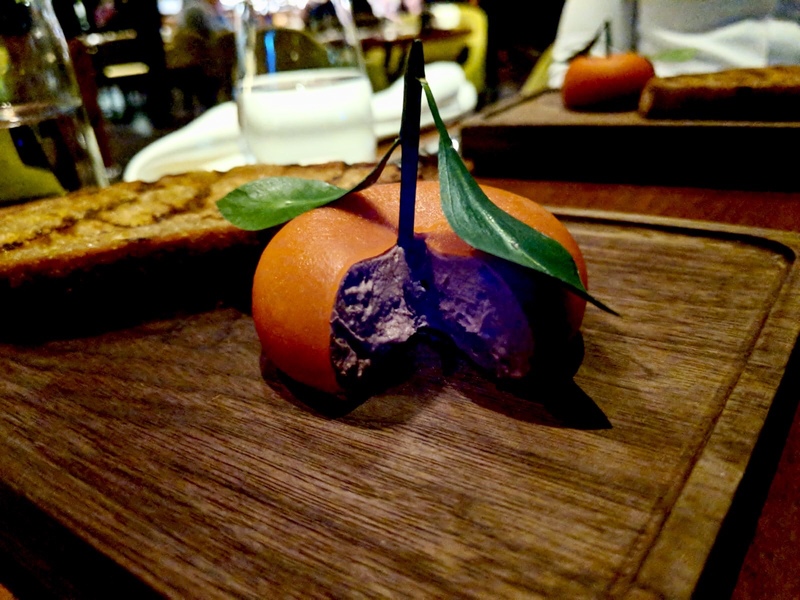 Meat Fruit: Mandarin, chicken liver parfait & grilled bread. The mandarin gel is so thin but held the liver parfait well. You can see that the texture of the mandarin fruit is mimicked in this dish. The parfait is not super strong but still has that pate flavour. Very smooth to spread onto the grilled bread. The grilled bread was very warm and melted the parfait which brings the sweetness out. Try the bread cooled, then spread the pate to the bread, it gives another taste. The flavour is stronger and creamier. Two ways to explore. There wasn’t enough bread to parfait ratio, but thankfully the waiter asked if we want more bread, we loved it. Our second course is Hay Smoked Kingfish, pickled lemon salad, gentleman’s relish, wood sorrel & smoked roe. The non-diary version was changing the sauce to citrus sauce. Can you see the difference? Smoked Kingfish was beautiful. I’m not a fan of roe, but having it smoked is quite pleasant and the pickled lemon salad made it so refreshing and appetising. Great starter. Salted Cod, Roast snapper in cider, pickled onion & parsley broth. Fish was cooked well but nothing that stood out to me on the substituted dish instead of the Rice & Flesh. Rice & Flesh, Saffron, curried kangaroo tail, red wine & amaranth. The kangaroo tail was a couple bite sizes and the rest was rice in saffron. Unfortunately I didn’t like how the rice was cooked, it had texture but felt like it wasn’t cooked well. I don’t usually have saffron rice so I don’t know if that’s how its meant to be eaten. Harder than al dente? The Amaranth made the saffron dish pop visually. Chicken cooked with Lettuces, Grilled onion emulsion, oyster leaf & spiced parsnip sauce. Beautiful tender chicken breast laid with lightly seasoned skin on top. Then fried chicken skin presented with fresh lettuce leaf – adding the crunch to the dish and onion emulsion dollop. The onion emulsion was quite strong and salty that I prefer dipping the chicken with the spiced parsnip sauce over the emulsion. Presentation is amazing esp on the lettuce it’s like a ship. J had Roast Groper and Green Sauce instead of the chicken. Braised chicory, clams, parsley, pepper, onion & Eucalyptus. The broth is very clear with the mussels. For dessert he had the Chocolate bar which was the substitute. Inside the chocolate bar is ginger syrup in a form of a gel but quick to liquify. I really liked the idea of ginger in the chocolate that cut through the sweetness. The sorbet had a thin coating that held it together. Very tangy and tasted like berries with the sourness. Again, we got sweet, spice, sour and crumbs from the aired raspberry. I of course, had the Tipsy cake – spit roast pineapple. It was a real treat to finish off. The cake was baked moist and soft, it soaked the juice on the outside but not overdone, look at the inside and the cake was airey and dry. Biting it, the outside sugar dusted on top gave the crispy coating and once it’s all in your mouth you could taste the tipsiness of the juice! The roast pineapple brought back the tanginess to the dish. It wasn’t very sour because grilling it brought out the natural sweetness of the pineapple. Lastly, we weren’t aware that we were going to receive some after meal treats, but the waiter brought out a orange & citrus shot for J. For me, infused earl grey chocolate fudge with chocolate biscuits. I really liked the earl grey for the after meal treat. It tasted like mint chocolate but better. A refreshing palette to finish of my meal. That ended our experience of the 5 course dinner. As we exited every waiter and waitress we passed would thank us and greet us goodbye. It was super lovely to feel welcomed in a fine dining restaurant. It sometimes could feel overwhelming and snobbed off when you walk into a fine dining restaurants. Dinner by Heston Blumenthal was not the case. And how could we not take a photo with their sign upon departure.